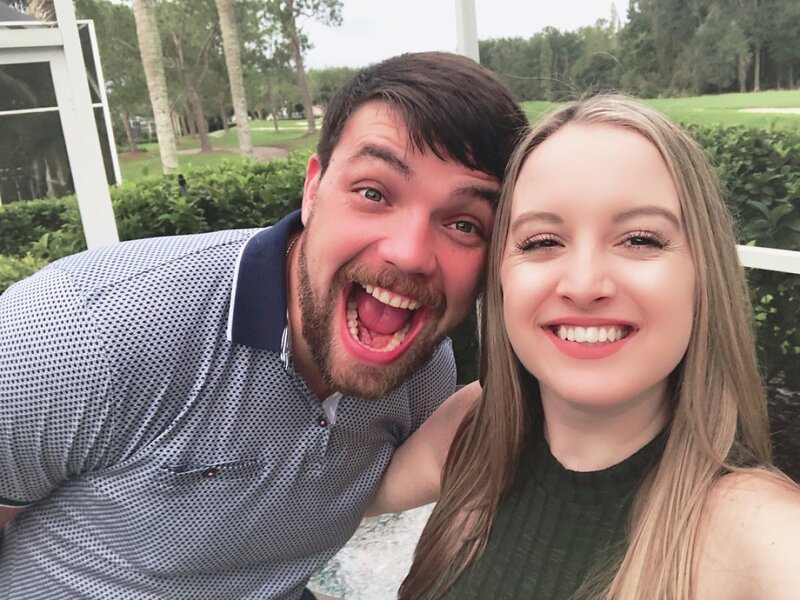 90 Day Fiance couple Elizabeth Potthast and Andrei Castravet have confirmed they have a baby on the way, and they've revealed the gender! Elizabeth and Andrei, who appeared on Season 5 of 90 Day Fiance in 2017, are going to be parents to a baby girl, Cosmopolitan reported. The reality TV stars said they discovered Elizabeth is pregnant in May, about six months after their 90 Day Fiance season wrapped on television. Elizabeth, from Florida, and Andrei, from Moldova, were reportedly enjoying a road trip through Florida when Elizabeth suddenly felt off. She also had no appetite at all. "I was feeling really foggy-headed and weird. I kept telling Andrei, 'I think pregnant! I think pregnant,'" Elizabeth told the magazine. Elizabeth therefore took a pregnancy test upon returning home and the results confirmed her intuition. Elizabeth reportedly put her hand over her mouth, jumped back, and told Andrei, "Babe? I'm pregnant." "I was like, No way," Andrei, 32, told Cosmo. "It was a total surprise. We didn't plan it." Elizabeth then paid a visit to the doctor, before revealing to her father -- who has had his fair share of issues with Andrei and his daughter's relationship -- she's expecting. Elizabeth told the magazine, however, her dad has been supportive. In fact, the mom-to-be's family, including her dad, recently got together for a gender reveal party, during which Elizabeth and Andrei found out they are going to welcome a baby girl into the world. "Everyone was screaming," Elizabeth shared. "Most of my family counted on it being a girl, and everybody was right. We just kind of had this gut feeling." Elizabeth and Andrei, who is still waiting to obtain a green card, will reportedly stay in Tampa, FL, until the baby is born. No decisions have been made yet in terms of where the couple will put down roots. But one thing is for sure -- the reality TV stars will have a second wedding in Moldova next year, according to Cosmo, and the baby will grow up to know her dad's culture and language. Elizabeth and Andrei want their child to be "worldly." Elizabeth's brother-in-law, Orlando Davis, spilled the beans on her pregnancy during a segment of his radio show called Orlando and the Freakshow on October 1. Orlando was asked by a fan whether he likes Andrei, and the radio host bluntly responded, "He's a good guy, he takes care of his wife, they got a baby coming." "I was extremely, extremely upset, and I still am," Elizabeth told the magazine of the leaked news. "We've done such a good job of keeping it hidden. We literally never talk to him, and we feel like he probably saw an opportunity to get some ratings on his show. We never said he could say anything." "The question was totally different," Andrei added. "He had a question, supposedly from a fan, and it was, 'Does he like me or not?' I don't know why he had to reveal." Regardless, Elizabeth and Andrei are now excited their big news has gone public and Elizabeth can share her pregnancy experience with everyone. "We're really happy to be able to have the opportunity to share our journey, and show people that it is possible to do a long-distance relationship," Elizabeth said. Andrei moved to the United States in September 2017, and then the pair tied the knot in October 2017. After starring on 90 Day Fiance, the couple also appeared on Season 2 of the 90 Day Fiance: What Now? spinoff that aired earlier this year. Season 6 of 90 Day Fiance is set to premiere Sunday, October 21 on TLC.